I was looking for a recipe that would 1) be delicious 2) be protein rich 3) be filling and 4) make left overs! This recipe definitely succeeded in all these requirements! 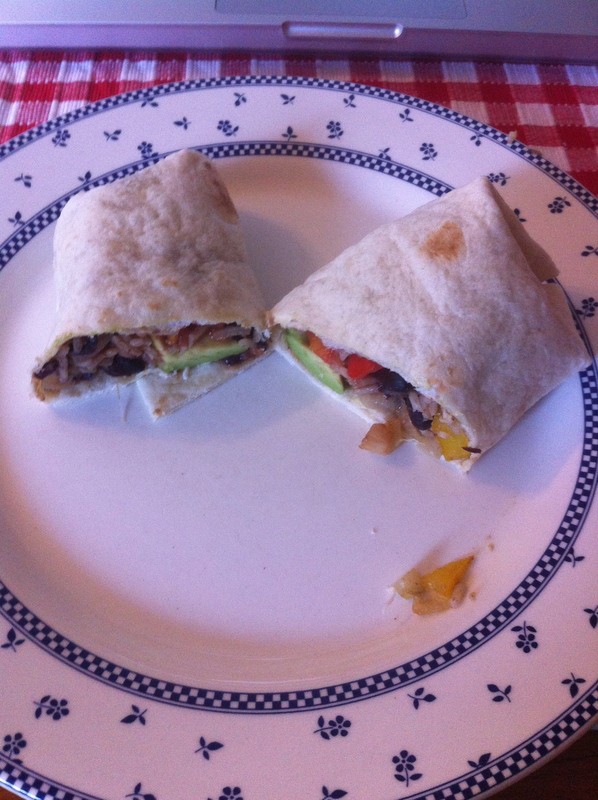 These burritos were quite delicious, especially with some chopped avocado and spicy wrap sauce. Heat olive oil over medium heat in a large skillet. Saute onion and garlic until tender, approx. 5 minutes. Once tender, add seasonings. Add black beans, kidney beans, peppers, and rice. Saute on low heat until vegetables are tender and beans are heated through (~10 minutes). Once filling is done cooking, spoon some into tortilla wraps. Garnish with avocado, salsa, etc.